« Quality Spring Break Time! Some nice weather the past few days, even with the wind. Nice today, in the 70s, and we can expect the same tomorrow with a slight chance of showers later tomorrow afternoon. Tuesday we might see mid 60s, then back into the 70s for Wednesday and Thursday. Bad news there is both of these day have possibility of showers….40% on Wednesday and 70% on Thursday. Clearing and 60s through the weekend. Low generation yesterday afternoon and again today. Tomorrow the projection is for no generation other than 1 hour at 8:00 a.m. Otherwise, no generation! Carolyn on the water Friday with Joe from Texas. 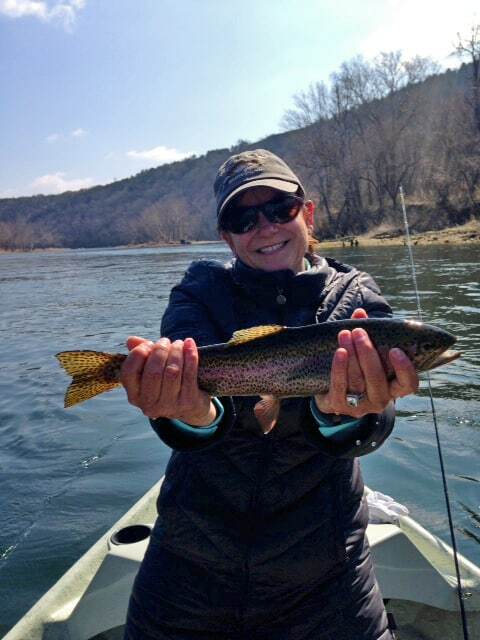 He and Pam had taken our two-day fly fishing school last year and decided it was time to do some fishing. Unfortunately, Pam did not go with us as it was a little cool Friday. Many times during the day, Joe and I both said “we wished Pam was with us” as it was such a good day on the water. Best patterns on this overcast day were the blue poison or copperhead black zebra under the big ruby. It fished well just about everywhere we tried. Saturday, Dana took Mark from West Plains out for the day. Mark had a good Happy Birthday day catching fish stripping the holographic green crackleback. This was a birthday present from his wife. 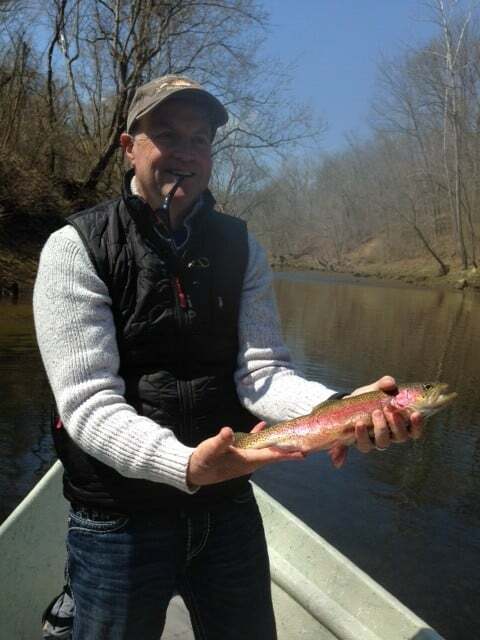 This was Mark’s first experience fishing Taneycomo and he thought it was a pretty nice fishery. 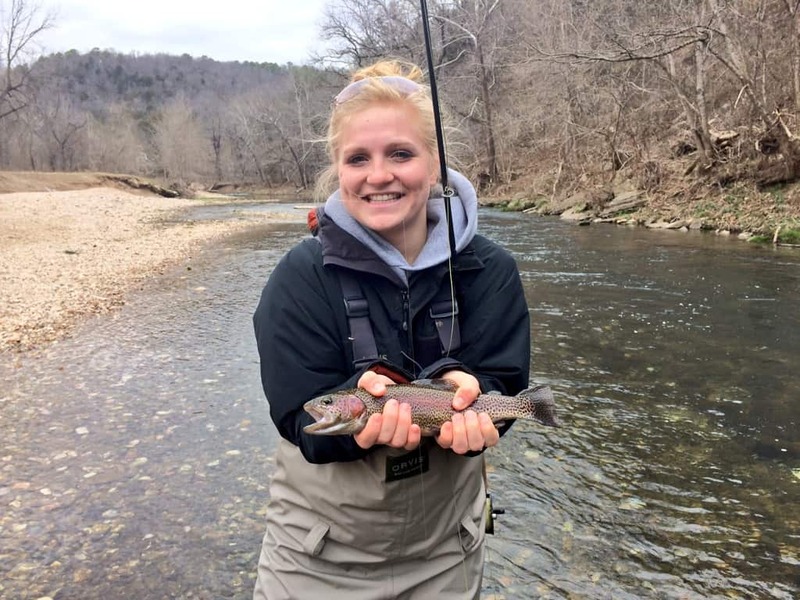 Living in West Plains, he fishes the North Fork of the White, 11 Pointe River as well as parts of the White in Arkansas. Jim had Ron and his son, Ben, from Maine on the water for half a day. Cool thing for these guys. Ron needed to get some more training for the work he does and his son had recently joined the Marines. Somehow, they both wound up at Ft. Leonard Wood for their training at the same time. This trip was some quality time together doing something they both like. They had a good day too on the holographic green crackleback. Joel and his son, Gary, spend the morning with Stan. Lots of fish for these guys drifting lighting bug. Carolyn had Rick and Kristi from St. Louis out for half a day. We started out the morning with the faster water catching fish on the big ruby with either a red midge ot the blue poison midge dropper. Later in the day, we found our own special fishing hole and spent the rest of the trip using the copperhead black zebra midge under a copper dun or P&P midge. Good couple to fish with and good, fun trip. We had this one gorgeous rainbow that kept swimming by and distracting both of them causing them to miss a lot of hits. Finally, Rick hooked her. This is one of those time when I wished I had a better quality camera as the picture I took does not get close to doing this fish justice! Good news was the fish stayed away from them for a while so they started hooking more fish as the distraction was gone! Ron and Ben had so much fun Saturday, they came back and booked another trip for Sunday. So, Darrell took them out for half a day. Another good day for these guys on the big ruby, the lightning bug and again stripping the holographic green crackleback. Stan had Joel and Gary out for a second day of frolicking in the river, and another good day for them! My coment to her was “do you know how many years it was before I caught a fish on a dry fly?” What a way to start! I hope Mary and Anna keep sharing this great sport! THE OTHER ITEM IS, SOMEONE HAS HACKED MY AOL E-MAIL . SO, IF YOU RECEIVE OR HAVE RECEIVED SOME OFF-THE-WALL MAIL FROM CAROLYN PARKER OR RIVER RUN OUTFITTERS…..WE APOLOGIZE. WE ARE WORKING ON GETTING IT RESOLVED. 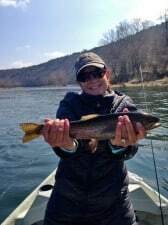 This entry was posted on Monday, March 31st, 2014 at 10:04 am	and is filed under Fishing Reports. You can follow any responses to this entry through the RSS 2.0 feed. You can leave a response, or trackback from your own site.